For English speaking readers lacking the intellectual and cultural background to understand the transformation of French philosophy after the Second World War, French theory is something of a puzzle. First, there is the organization to the books and essays themselves. For the Anglo-American reader and writer, it is standard practice to create a narrative that builds from beginning middle and end, with the main point at the conclusion. To those readers, it is confusing when a French writer embeds the main argument in the middle and even more baffling then the same ideas are repeated throughout a book, appearing and reappearing. But this approach is very French. In France, American directness and desire to get to the point is considered rude and aggressive. All conversations begin, not with the purpose but with a lead-in, and, after slipping in the substance in the middle, end with additional elements that are ancillary. The substance is built up, often through repetition and reiteration, and this substance will be revisited across many books. This mode of writing is very clear in the works of Roland Barthes (1916-1980), especially in his last book, Camera Lucida (1980) where the most significant section–about Death–is in the middle, where his main them surfaces. Michel Foucault was a historian who, at the time his books were published, in the sixties and seventies, was denounced by traditional historians. Today, his theories have had impact, not just on the profession of history but also upon the humanities in general, even generating a new way of examining historical conditions through an analysis of discourse. Unfortunately, most students in colleges and universities encounter Foucault through a list of assigned readings, devoid of context, forcing the readers into a very complex debate that was interdisciplinary: historical, philosophical, linguistic, with little or no preparation. In order to understand what Foucault was both not doing and was doing, it is necessary to have extensive background in Enlightenment philosophy–years of reading are required, from Kant to Hegel. History, as it is known today, from a traditional perspective, was developed in the Nineteenth century in a period of optimism, positivism, and dominance of the known world by Western powers who were convinced of a grand idea called “progress.” It was Georg Hegel (1770-1831) who developed the theoretical basis for history: thesis, anti-thesis: the clash that produced synthesis or progress and evolution. The establishment of the concept that “history” was driven by an “engine” towards “progress” led, intentionally or not, to the neglect of women and people of color, who were considered to be rooted in “nature” and therefore incapable of being part of “culture” or history. Even though Hegel’s tripod approach was ideal or abstract, the effects upon the writing of history was very real. From the standpoint of minority groups, history became a history of “great men” and their deeds, which is why Foucault supported not just homosexual rights and also women’s rights. History, then, has a purpose and life, then, has meaning and purpose. The role of the historian is to tell a tale of progress-as-meaning. In order to construct this narrative, the historian works within the confines of the larger meta-narrative (life has meaning, reason and purpose) and connects events through the use of cause and effect constructs, which in turn construct unity and a smooth linear progression from point to point. This unity is in the service of the lesson or moral that is embedded in a seemingly scientific and objective analysis of a moment in time. Isolated and designated as an “event,” termed “significant” and “important,” this event is seen in terms of the present and thus serves the purposes of what is called “the Master Narrative,” which is then presented as “history.” The master narrative in Western culture has always been concerned with and is in the service of continued dominance of those in power and the maintenance of their mastery of the Other. This process of making history is arbitrary and falsifying and is an act of sheer power, but Foucault did not judge, he merely examined. He was a libertine, not a revolutionary. He had seen the “revolution” (the days of May) and it never happened. Foucault was a sanguine observer who re-made himself into a archaeologist. Foucault located a different history, not one of events, but one of systems of representation or modes of order. “Western thinking” is a mere construct, implying a constancy, or a unity, that, in fact, does not exist. Foucault was able to locate different systems of epistemology, called épistemé, or the foundations of knowledge. The way in which the world is ordered has changed over time, indeed in the larger scheme of things, over a relative brief period, from the pre-Classical or pre-Modern era of the Renaissance to the Classical period of the 17th century to the contemporary time, the now of the late 19th century. Foucault is at his most maddening in this book, because he refuses to explain why an episteme would change from one century to the next. In fact it precisely the “why” Foucault avoids. The point is not way; the point is that one episteme is different from the one that preceded it. To select an example from the art world, Renaissance perspective was an example of the belief that perspective was a science that was capable of replicating three dimensional space. Part of the pre-Modern episteme was an ordering in terms of similitude and resemblance, but in contrast, the Baroque era, working under another episteme, played with trompe l’oeil and knew that the illusion of reality was not in terms of resemblance but due to the skillful use of representational codes. 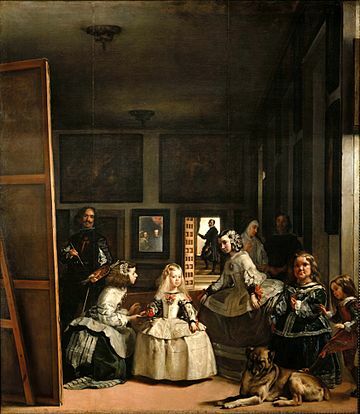 The Order of Things (1966/70), began with an essay on Diego Velazquez’s Las Meniñas (1656), a painting he used as an example of 17th Century representation, which was the belief in the transparency of representation. This gap is caused by the absence of the king – an absence that is an artifice on the part of the painter. But this artifice both conceals and indicates another vacancy which is, on the contrary, immediate: that of the painter and the spectator when they are looking at or composing the picture. It may be that, in this picture, as in all the representations of which it is, as it were, the manifest essence, the profound invisibility of what one sees is in­separable from the invisibility of the person seeing – despite all mirrors, reflections, imitations, and portraits. Around the scene are arranged all the signs and successive forms of representation; but the double relation of the representation to its model and to its sovereign, to its author as well as to the person to whom it is being offered, this relation is neces­sarily interrupted. It can never be present without some residuum, even in a representation that offers itself as a spectacle. In the depth that traverses the picture, hollowing it into a fictitious recess and projecting it forward in front of itself, it is not possible for the pure felicity of the image ever to present in a full light both the master who is representing and the sovereign who is being represented. Perhaps there exists, in this painting by Velazquez, the representation as it were, of Classical representation, and the definition of the space it opens up to us. And, indeed, representation undertakes to represent itself here in all its elements, with its images, the eyes to which it is offered, the faces it makes visible, the gestures that call it into being. But there, in the midst of this dispersion which it is simultaneously grouping to­gether and spreading out before us, indicated compellingly from every side, is an essential void: the necessary disappearance of that which is its foundation – of the person it resembles and the person in whose eyes it is only a resemblance. This very subject – which is the same – has been elided. And representation, freed finally from the relation that was im­peding it, can offer itself as representation in its pure form. It was Foucault, more than any other Postmodern writer, who combined Saussure and Marx at the level of language and ideology to critique “representation.” Representation was linked with power. Those who represented were those who owned the “gaze”, those who had or owned or used the power to depict and to portray. Representation was an act of ideology, implicated in a system of oppression, and never innocent, never transparent. Las Meñinas was a painting of painting as a belief system, that contains within itself the mirror, a relic of the old belief that a portrait could replicate the King and Queen as a mirror, a belief in the absolute ability of painting to represent “transparently,” as a mirror of nature. Velasquez has turned his canvas to the viewer, concealing the “work” of representation while at the same time emphasizing that pure visibility is impossible. The “order” or “things” must be recounted through indirection. The new arrangement brought about the appearance of a new problem unknown until then: in the sixteenth century, one asked oneself how it was possible to know that a sign did in fact designate what it signaled; from the seventeenth century, one began to ask how a sign could be linked to what it signified..This involved an immense reorganization of culture, a reorganization of which the Classical age was the first and perhaps the most important stage, since it was responsible for the new arrangement in which we are still caught–since it is the Classical age that separates us from a culture in which the signification of signs did not exist, since it was reabsorbed into the sovereignty of the Like.. The classical episteme, Foucault explained, was binary and therefore arbitrary and functioned within a system allowed the random relationship between the word and the thing to be considered “universal.” “All of this,” Foucault said, “was of the greatest consequence to Western thought. Resemblance, which for a long been the fundamental category of knowledge–both the form and the content of what we know–became dissociated in an analysis based on terms of identity and difference.” Foucault laid out the rift between similarity and difference and the division between the activity of interpretation that must be activated in the case of resemblance and the new mode of epistemology which is analysis. The Classical episteme orders scientific knowledge along a system of contrast rather than similarities. Until the end of the eighteenth century, this new analysis has its place in the search of the representative values of language. It is still a question of discourse. But already through the inflection system, the dimension of the purely grammatical is appearing: language no longer consists only of representations and of sounds that in turn represent the representations and are ordered among them as the links of thought require; it consists also of formal elements, grouped into a system, which imposes upon the sounds,syllables, and roots of an organization that is not that or representation.